If you’re in ‘the resistance’, in July 2015 the screw turned a little tighter for you as Microsoft also called time on arguable their most successful operating system to date, Window Server 2003. Yes, if you’re a small business, your hand is certainly being ‘encouraged’ in to an upgrade of some description. 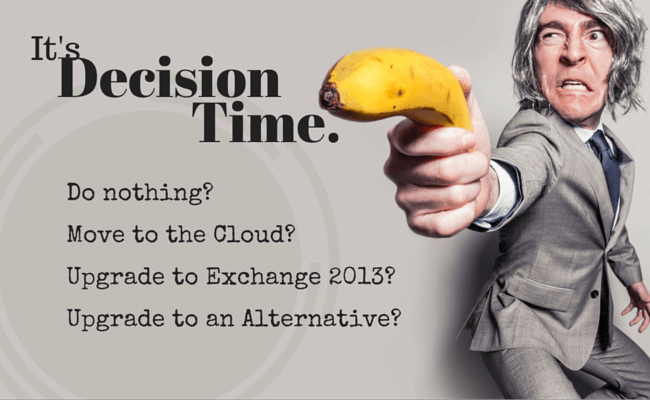 The obvious choice if you have an on premise Exchange server is to upgrade to the latest version, however it’s by no means your only option. In this guide I’ll take a look at some of the others available to you. The most important aspect of Microsoft’s end of life news is that if you’re using Exchange 2003 on its own, or as part of Small Business Server 2003, both your mail platform and your operating system are now unsupported. Holding off upgrading hopefully hasn’t caused you any issues thus far, but you’re exposing your business to an unnecessary risk – doing nothing certainly isn’t an option we’d recommend for the foreseeable. Additionally you may run in to problems with your network administrator as they attempt to troubleshoot ten-year-old technology without patches, bug fixes or support from Microsoft. Microsoft would of course like you to get on board and be a tenant of their shared cloud Exchange mail platform, Office365. That makes absolute sense for some small businesses, but it’s important to remember that it’s not your only shared cloud option. It’s also worth looking at services such as Google Apps and the many independent hosted Exchange/ email providers such as Rackspace, Cobweb and Intermedia. Security – Be aware that you’re trusting a third party with data that’s important to your business and also that you are sharing a platform with other ‘tenants’. Features – Check your intended cloud provider offers the same level of control and functionality you’re used to with an on premise solution. Some shared platforms are ‘dumbed down’ to cater for the mass market. Support – Look into the level of support offered. In the event of an issue, will somebody be available at the end of the phone when they’re needed? Will they have the expertise to help you quickly? Despite the many benefits that shared cloud email services have to offer, there are still plenty of businesses who either don’t like the idea of handing over control of their email to a third party, can’t because of Internet bandwidth limitations or who aren’t allowed to because of industry regulation. Flexibility – Support for physical, virtualised and hosted environments depending upon your needs. Security – The peace of mind your email server is dedicated to your business and that only authorised personal have access to your data. Backup – It’s typically simpler to include a dedicated email server in an existing backup scheme than to back up data located on remote shared infrastructure. Performance – While many shared platforms are robust, a dedicated solution removes the inherent risk of multi-tenancy that one tenant could at times consume the majority of system resources. Functionality – Dedicated solutions tend to offer a wider feature set, including options such as email marketing list management, HTML footers, ticketing systems, custom content filtering and mailbox mirroring. Regulation – In some business sectors, not having custody of your data and control over how it’s managed may cause legal/ regulatory issues. 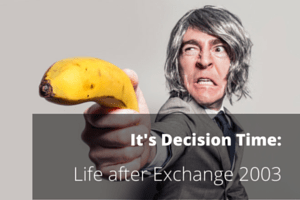 With no direct upgrade path from SBS 2003, a hefty price tag for licences and Enterprise-level complexity, it’s hard to see how Exchange 2013 has a place in the modern small business. Microsoft have well and truly set out their stall. It’s cloud-shaped there’s a big ol’ Office365 logo on it. If you like the benefits of a dedicated mail server on-premise but are adamant it has to be Exchange, you need to be prepared for a complex migration process as there’s no in-place upgrade available. You would first need to move from Small Business Server, then to Standalone 2008R2 and finally Server 2012R2. 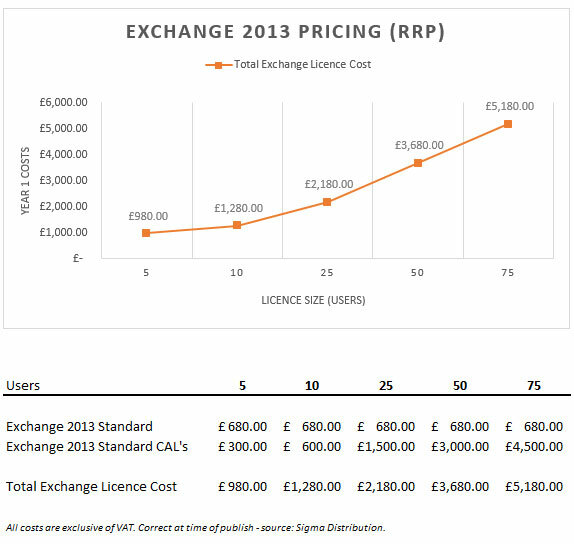 As the sample pricing below indicates, there’s also some considerable outlay for your licences as you pay for both Microsoft Exchange 2013 Standard licence and then the appropriate number of CAL’s as show below. Exchange isn’t the only option if you’re keen to retain the benefits of your own dedicated email server. A quick Google search produces lots of alternatives designed to work both on premise and in hosted environments. 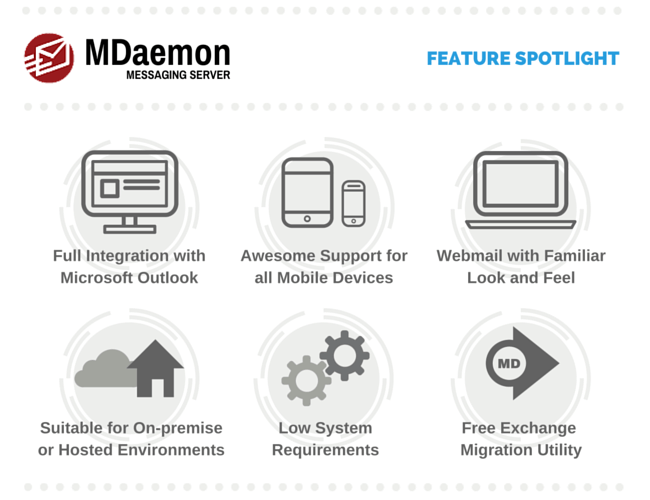 One of those alternatives is MDaemon Messaging Server, which offers a familiar user experience to Exchange but without the same level of cost and management complexity. By focusing only providing only those features small businesses typically make use of in Exchange (and some extra ones too), MDaemon has been voted the number one alternative to Exchange over at Spiceworks. In Summary – Just do something. The key ‘take away’ from this post should be awareness that there’s most definitely a decision to be made. If you’re still undecided on how life after Exchange 2003 will look, I recommend a good starting point is to really thinking about how your company specifically uses email. Where do staff access their email from? Is it mainly from the office or are they remote and distributed across different branches/ locations? True ownership costs – look beyond the first year and consider the total cost over three years for example. I hope that’s been helpful – if you’ve got any questions or comments it’s always good to hear from you so please feel free to either leave a note below or contact me directly in the normal ways.